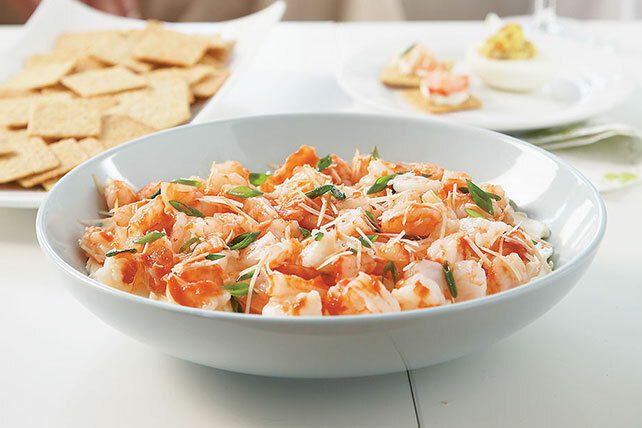 Take just 10 minutes before the party begins to make this PHILLY Shrimp Cocktail Dip! You only need five ingredients for this PHILLY Shrimp Cocktail Dip. Spread cream cheese onto bottom of shallow bowl. Toss shrimp with cocktail sauce; spoon over cream cheese. Substitute 1 pkg. (8 oz.) imitation crabmeat, coarsely chopped, for the shrimp. Substitute Buffalo wing sauce mixed with 2 Tbsp. HEINZ Tomato Ketchup for the cocktail sauce.